CONCRETE SAW 10 INCH WALK BEHIND ELEC. Rentals Ft. Collins CO, Where to Rent CONCRETE SAW 10 INCH WALK BEHIND ELEC. in Ft. Collins, Wellington, Greeley, LaPorte, Loveland, Windsor CO and all of Northern Colorado. CONCRETE SAW, 10" WALK BEHIND ELEC. Electric walk behind saw, with water feed. Great for basement cutting. Rental blade is an additional charge to be automatically added. Weight 133 lbs., 1.5 hp., 10' blade cuts 2" deep max. Saw is 35" tall, 41" long, 17" wide. 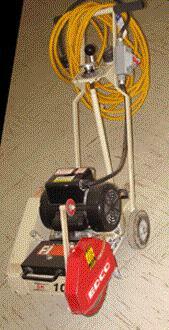 * Please call us for any questions on our concrete saw 10 inch walk behind elec. rentals in Fort Collins, Wellington, Greeley, LaPorte, Loveland, Windsor CO and all of Northern Colorado.